Hope your Thursday is a good one so far. Today I am sharing a project I created for my daughter. Recently she graduated from High School and so I made this set for her. The grad cap box is a Pazzles Craft Room cut file. The leaves are also a Pazzles Craft Room Cut file. I used the same concept as my folded paper roses. Here is a closer look at the grad cap. I cut it in blue as that her school colors….blue and silver. I made the tassel using some crochet string. The 2014 is also a Pazzles craft room cut file. I cut it in plain white cardstock and then used my silver metallic marker to color it silver. I did add a “loop” to the top of the number to make it a “charm”. Here is what the box looks like opened. I was able to fill it with a whole 11 oz. bag of Hershey's hugs and kisses. I used my chalk marker to do the faux stitching along the top of the cap and the “hat” part underneath. Here is a closer look at the dollar bill roses. I used the same technique as the folded paper roses I have made before. I have a tutorial and video on that: HERE. It took five one dollar bills to make each rose. The main difference is I had to figure out how to make the dollar bills fold together without using any glue or tape so that pulling them apart would be quick and easy. Once I did finish rolling and folding, I used regular floral tape to wrap the bottoms tight so they would stay on the skewers. I then cut the leaves out from some green Bazzil cardstock and the Leaf file from the craft room. This was some Bazzil I have had in my stash for quite some time and I am pretty sure it is a discontinued paper. It just matched the color of the floral tape the best. Here is one last look at the completed bouquet and cap. I think I hit everything a girl likes to get with the exception of jewelry. Candy, Flowers and money….lol! Oh, wow, Melin! This is amazing! LOVE all those money blooms! Bet your daughter did, too ;). Love this vase of roses!! It takes dedication and time, not to mention love, to create something like this. Well done to both you and your daughter! I love this gift. At first I thought for sure you used "fake dollar bills", so she could keep it. Then I realized how many flowers there were, and thought "no way". Then (lazy me) I read your post, and thought AWESOME! Nicely done! Amazing!!!! 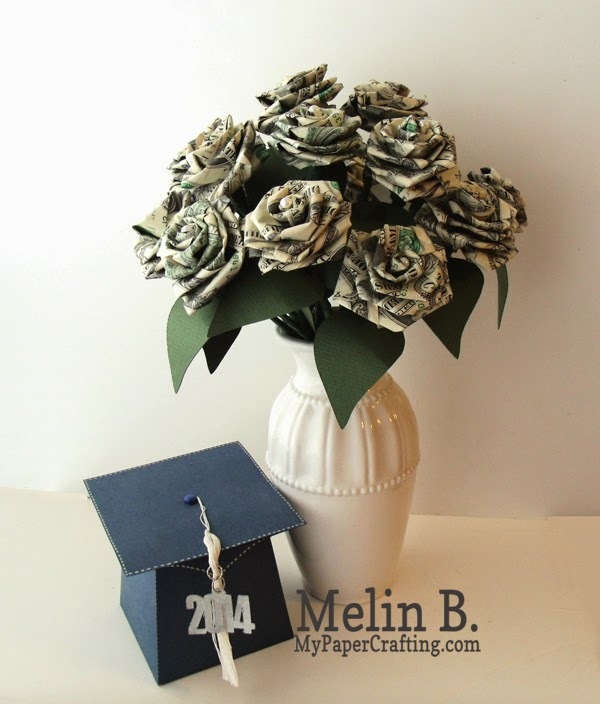 You are so talented making the roses - especially with out any glue!! Congratulations to your daughter and you on the graduation. Thanks for the inspiration!! Hi, my best friend is graduating in December 2018 and I think this is an amazing gift. Would you be willing to make me a bouquet?